A simple cause & effect app created for a student with auditory & visual impairments. 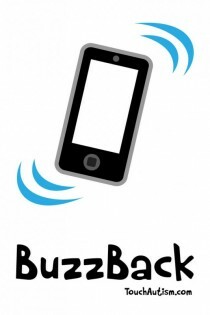 This app is built to be run on iPhones as it uses vibration as the primary reinforcer. A simple cause and effect app created for a teacher of a student with auditory and visual impairments. 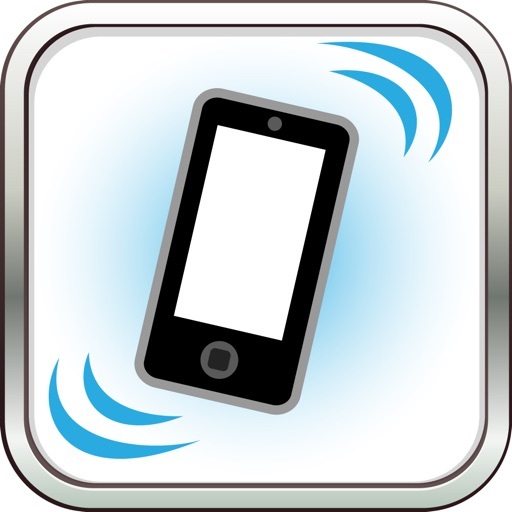 This app is built to be run on iPhones as it uses vibration as the primary reinforcer. 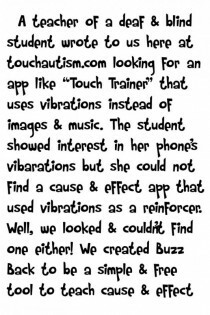 A teacher of students with visual and auditory impairments wrote to us here at touchautism.com to ask if we knew of an app like our app “Touch Trainer” that uses vibrations instead of images and music as a reinforcer. Her student was interested in the vibrations of the phone, but there was no app out there that taught cause and effect using vibration. 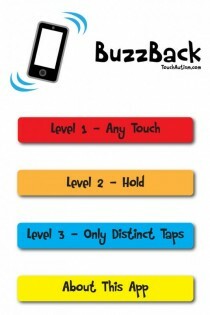 We created BuzzBack to be a simple and free tool to teach cause and effect using a phone’s vibration as a reinforcer. The app has three simple settings to teach students different finger commands on the iPhone. Thank you all teachers for all of the incredible work that you do! Awesome!! – This app is awesome. It will work great for teaching cause and effect to students with visual and hearing impairments. Thank you so much!